Color fundus photographs and Fundus fluorescein angiograms (FFA) of wild -type (WT), Kimba, Akita and Akimba mice. WT mouse showed regular arterial and venular caliber, branching, and tortuosity in the retina – A–F. Kimba mice had multiple spots of hyperfluorescein (bright spots) throughout the retina – G–L. Akita mice displayed a slight increase in tortuosity with no signs of leakage – M–R. Akimba mice showed vasculature abnormalities inherited from parental strains, with high severity of leakages accompanied with tortuosity and significant loss of capillary density – S–X. Credit: Shyam Chaurasia. 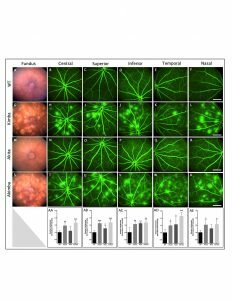 Using advanced retinal imaging techniques, the scientists tested these diabetic mice that processed NLRP3. Using a new technique called laser speckle flowgraphy, the group was able to create the “heat map” of blood flow volume and found significantly decreased levels in the NLRP3 mice. These mice also showed an increased prevalence of a buildup of macrophages in the retina that could be caused by immune responses involved in chronic inflammation that leads to diabetic retinopathy. 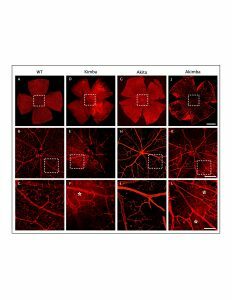 Loss of retinal capillary density and vessel leakage in Akimba mice. Isolectin-GS IB4 staining on retinal flat mount showed normal vascular bed and uniform capillary distribution in WT (A–C) mouse, which was reduced markedly in Kimba – D–F, Akita – G–I – and significantly higher in Akimba – J–L – mice. Disruption of the capillary network was noted especially around the optic disk of Akimba – K – retina. Credit: Shyam Chaurasia. 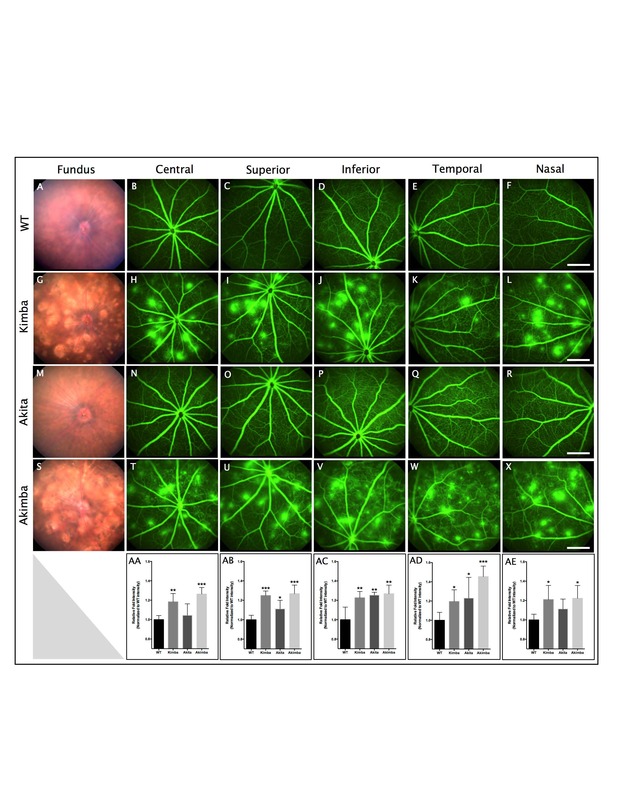 The study, “The NLRP3 Inflammasome May Contribute to Pathologic Neovascularization in the Advanced Stages of Diabetic Retinopathy,” was published in Scientific Reports. 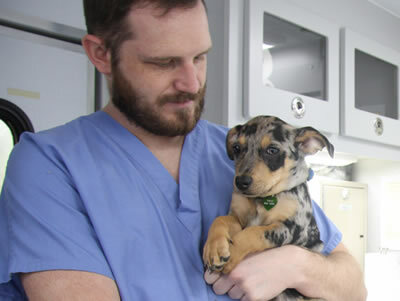 Major funding was provided by Department of Veterinary Medicine and Surgery Start-up grant to Dr. Chaurasia. The content is solely the responsibility of the authors and does not necessarily represent the official views of the funding agencies.